Rich’s Winter Stone from Richard Strolis on Vimeo. Here’s a good, simple winter-stonefly pattern from Connecticut-based guide Rich Strolis. Winter stoneflies are common across the country, so this pattern should work almost anywhere. Rich says he primarily fishes this fly deep under an indicator in the winter, usually as a dropper. . . I just left Harris Springs Sportsman Preserve down in Waterloo, South Carolina, deep in the pine and Harwood Piedmont region in the northwest part of the state, the transition region that buffers the Appalachian range from the coastal plain. It is a quiet and unassuming lodge in a quiet and unassumingly beautiful part of the south. It is a small lodge. They only take eight hunters at a time at most, but if ever there was a poster child of the axiom quality not quantity, it is Harris Springs. My son Nick and I came in late Sunday night after driving 24 hours down from Vermont. No one was there, as it was the day after Christmas, but manager Mark Seay had remained in constant contact with us on our way down. The gate was unlocked and the Rock House was waiting for us. “Once in a Blue Moon” is Online! Last year’s hit fly-fishing film “Once in a Blue Moon”—about casting mouse patterns for huge trout in New Zealand is now online at Hulu.com. Husband-and-wife team Carl McNeil and Jeannie Ackland covered a lot of ground to capture glorious footage of big trout and mice, and the resulting film. . . Guess the Breed and Win a FREE Orvis Dog Bed! Take a guess at our trivia question and, right or wrong, you could win a FREE ToughChew® Dog’s Nest® from Orvis! This breed (which is NOT pictured below), measuring at minimum 31 inches at the shoulder is the tallest of the dog breeds. A gentle giant, this dog makes a loyal family member, but will take up a lot of space on the couch. Let us know your guess in the comment section (click the READ MORE link and scroll to COMMENTS). We’ll pick a random answer, right or wrong to win the ToughChew® Dog’s Nest® worth up to $185.00! 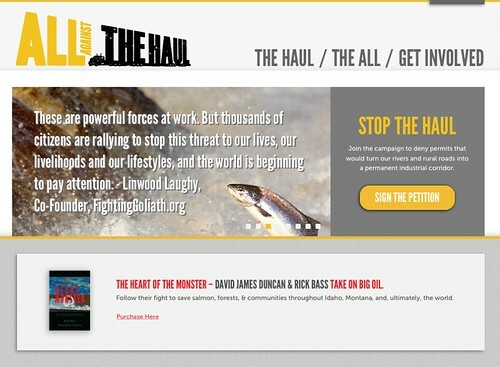 A new website called All Against the Haul has been set up to keep concerned citizens and conservationists informed about the battle to stop the planned trucking of massive mining machinery along roads in wild Idaho and northwestern Montana—including right along the famed Big Blackfoot River. David James Duncan and Rick Bass are donating the proceeds. . . Team Steelhead Odyssey stands next to one of the giant trees in Olympic National Forest. The fishing on the Bogachiel River has proven to be tough because of all of the gear fishermen. Although there are a lot of fish in the system, it is hard to find spots. . .
Saturday night, my oldest son Nick and I began a 3000 mile road trip to pick up the next member of the family: a six-week old black Lab puppy. His name will be Murph in honor of Bob Murphy, a good friend, a great sportsman, and a true gentleman, something I hope his namesake will become in the next few years. Murph will become the fifth Labrador we’ve had in this family. The first was Mushroom, a yellow who was our first dog after Mimi and I got married. He lived up in the deer camp with us before we were married. Trinity River 2011 from Brannon on Vimeo. This gorgeous film of fly fishing on California’s Trinity River will have you planning a trip to West Coast next season. The Los Angeles Times explores the battle between Colorado conservationists and the Sierra Club over the organization’s support for a project, envisioned by the late artist Christo, called “Over the River.” The art installation would suspend panels of fabric over 5.9 miles of the Arkansas River, . . .
Montana fly-fishing guide, Simon Perkins is back home in Vermont for Christmas and joins Tom for a podcast on lessons learned the hard way. It’s the mistakes that make us wise, if we learn from them. Learn from Tom and Simon’s mistakes so you dont have to make them yourself! What are some of your hard-learned lessons? Let us know in the comments.